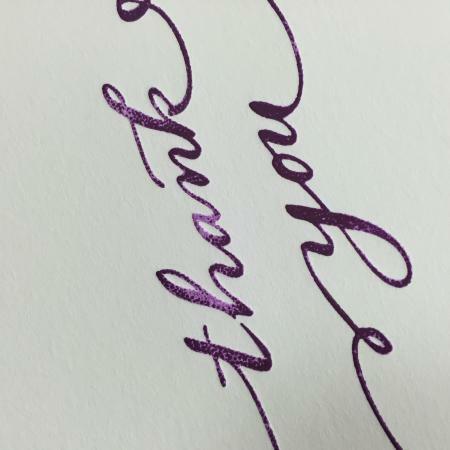 Hi, I am trying out Southern Ink for the first time, Rubber based, and am having a weird coverage issue. adding a pic. it’s splotchy, almost pebbled. I’ve dialed in the roller height in, that is definitely not the issue, but still this is happening. more on the type than in a large flat area elsewhere. I spoke to someone at southern ink who suggesting adding a small amount of linseed oil, which has not made a difference. is it something else? do I need new rollers?? What are you using for the image? What do you wash your press up with? Your image looks very similar to others showing the same issues. Polymar plates need cleaned with a good alcohol or press wash. If your using anything other than a good petroleum based wash, you may have a glaze on your rollers. A good press wash is available at any paper house. Some ink suppliers sell it to. These press washes have vital chemicals that help maintain you rollers in excellent shape. It doesn’t appear to be either rollers or ink—it is in the film negative as a result of incorrect file preparation. Go back to the original file and see what it looks like enlarged and I bet you’ll see the same dot pattern. Though the ink coverage is too heavy in an attempt to correct the problem. It does look like a problem with the plate. Try the same ink with some type or a plate with small type that you know is good. I was using a magnesium plate mounted on wood from Owosso, from vector based art, was totally clean. I wash with oderless mineral spirits. I ended up moving the plate to another spot on the chase and the problem pretty much went away. Still surfaced in areas, so I’m thinking it’s either time for new rollers (been about 2 years, but I don’t print a whole lot), possibly even expansion trucks. I’ve been using metal trucks that came with my press for a long time, wondering if those are contributing to uneven inking in general. was reading an old thread, with related problems, Is it really imperative to take rollers off the press when not in use? since I don’t have a rack for them I always leave them on. Taking your rollers off are good. Have a rack though. You can leave them at the bottom of your chase. Just not across your ink disc. Mineral spirits does not match the chemical make up that a good press wash has. Might be why you feel your ink rolls are wore out. Regardless what others say, its best to use roller wash. I’ve seen mineral spirits strip the good qualities from good ink rollers. Swelling and soft spots can cause weird ink distribution. I am having this same issue with 2 different types of ink, tried different plates as well. My rollers also appear to have a dotted look to them when inked up, which I am sure is causing the dotted look on the print. My rollers could need a good overhaul, however, they came with my press and I have no clue how old they are. I know that when I tape my rails one of them won’t even hit the plate (so it looks like only one roller is inking it) so they could be minutely different sizes as well. I’m thinking I might just send them to Ramco but I want that to be my last resort. I may try new press wash first. I am also using Southern Ink at the moment. attached is my print from last night, so basically the same issue as your print. the uneven coverage is a result of roller height which I corrected on other prints, but it didn’t stop the dotted look or overall “too inky” look. I opted to upload this image as it closely resembles yours. more opinions appreciated! I’ll gladly have my rollers re done but I would like to exhaust all other options first. Thanks! Consider this scenario: you inked up the plate and made one print. This took most of the ink off the plate, leaving a small amount of ink still on the plate. 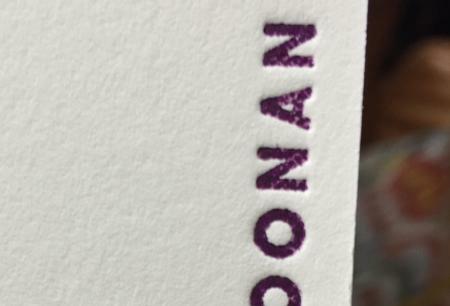 If you printed a second sheet without letting the rollers re-ink the plate, all of the image would be that light purple which is shown in spots on your print. That is the residual ink which is left on the plate after the first print. So, in your picture, your rollers have re-inked the plate after the first print, but not all of the plate, not where the lighter areas are. The rollers are not quite high enough, in spots, to ink the whole plate. If that happened to me and I had to get the job out, I would try putting a sheet or two of 16 lb or 20 lb bond (computer printer paper) behind the chase. This would hopefully raise the plate just enough to allow the rollers to ink everything, every time. (If you do that, take the same amount of thickness out from under the tympan). Geoffrey, the main issue with my prints is the dotted look and seeping of ink over my impressed edges. I chose to post that image because it really showed the dotted look showing up even on full coverage prints, that particular print was probably just what you mentioned - a second print without re inking just to see the result by experimenting. But the dotted look is there even when all letters are covered. I fixed the roller height issue…the sheet behind the base/chase is definitely good advice for the future though, thank you. Can anyone recommend good press wash for southern ink? I know the stuff I’m using isn’t great for this purpose so I would like to see if a good press wash will help my issue before having rollers re done. Does anyone think I also could be adding too much ink? Thanks in advance! You have not told us the type of press you are using. I wish I had used real roller wash instead of odorless mineral spirits that I was talked into using. Small diameter inking roller does not give the coverage you are looking for in solid areas. A good blanket roller wash used on offset press will give you a cleaner roller and inking plate. Start with a very small amount of ink on the inking plate. I have had inking issues in the past that looked similar to the pictures shown above when using mixed (rubber based) inks made up of large amounts of transparent white. Adding magnesium carbonate (gym chalk) to the ink or using opaque white instead of transparent white has solved this for me. I am using photopolymer plates from boxcar. I’ve been told it’s my plate but it’s done this with all my plates, so it’s an ongoing issue, not just the plates. I thought it was ink, so I bought new ink from Southern Ink. Same issue. I did not mix either of these inks with anything, they are straight out of the can. If someone could recommend a particular brand (and where to buy) the press wash I can try that and cross that one off my list as an issue if it doesn’t rectify the problem. I want to try as many things as possible before resorting to sending these rollers out. Thank you for your advice. My guess is that theres two things happening here. 1 is uneven inking from your rails being too high or low. The other is you’re using way too much ink. Thank you, I will try less ink (although it seems like I’m not putting much on at all!) I’ve experienced with taping the rails. Adding tape until it looks like I don’t have enough ink on my image, and then removing the tape until I get an even print. I have even prints, they’re just “inky” looking with the pebbled effect, so I’ll try a combo of experimenting with the tape and using less ink. Also still looking for a good name press wash to purchase. I think what I have been using could be leaving an oily residue which could definitely be causing my problems. Thank you! I had this happen on a job awhile ago. It’s definitely not a plate problem. My recollection is it was a combination of temperature in the shop and the viscosity of the ink. The ink was too thick and wasn’t laying down properly. I think it was also a little cold in my shop, which didn’t help matters.